Southside Wheely Wheelers Family Fun Day a Great Success!! After months of planning the big day finally arrived. Mother Nature obliged by keeping the summer rain at bay and even treated us to some sunshine, whatever next. SWW members were busy from early morning making sure the 8km and 30km routes were safe and well sign posted and that everything was ship shape at our fun day headquarters at Bruff RFC. DJ Robert was belting out the tunes to get the assembled cyclists psyched up for the big spin. At 12.15 the 8km cycle headed off, closely followed in time but not direction by the 30km group. Over 160 cyclists in all. The shorter cycle was run at a nice steady pace to accommodate the smaller kids while the 30km spin travelled a bit quicker while still making sure everyone stayed together. All junctions were well marshalled and as always the motorcycle mashalls did a wonderful job. There was a great welcome and applause for all the cyclists as they returned and the burgers, hot dogs, sandwiches etc went down a treat. The bouncy castles and slides were very busy and it was great to see everyone chatting and laughing and enjoying the day. This is what cycling and our club are all about and hopefully a lot of the people who took part will be encouraged to get on their bikes more and enjoy this wonderful, healthy sport. Congratulations to Sarah Herbert who won the top prize of a new bike in the raffle. Events like these need a lot of support to be successful and Southside Wheely Wheelers would like to thank the following, everyone young and old who turned out to cycle, Bruff RFC and Alan Enright in particular for making their facilities available to us, the motorcycle marshalls, Brenda Shanahan at Anderco and Brendan Ring at Cube Printing for signage, John Finn’s One Stop Party Hire for Barbecue and Bouncy Castles, Super Value Kilmallock, Deebert House Hotel, Glenfield Engineering, Kilmallock Cycles for raffle prizes, Limerick Sports Partnership, Civil Defence Ambulance Service, Ballyhoura, Scanlon’s Filling Station Ballybricken, Anna Finn for face painting and members wives and families for all the buns, cakes and good vibrations. Please support our sponsors and suppliers where possible. Finally, a massive well done to all SWW members who worked for months to make this happen, turned out on the day or helped in any way to make the first annual Southside Wheely Wheelers Family Fun Day a brilliant occasion. Roll on next year! SWW Family Fun Cycle is on Sunday 22nd July. 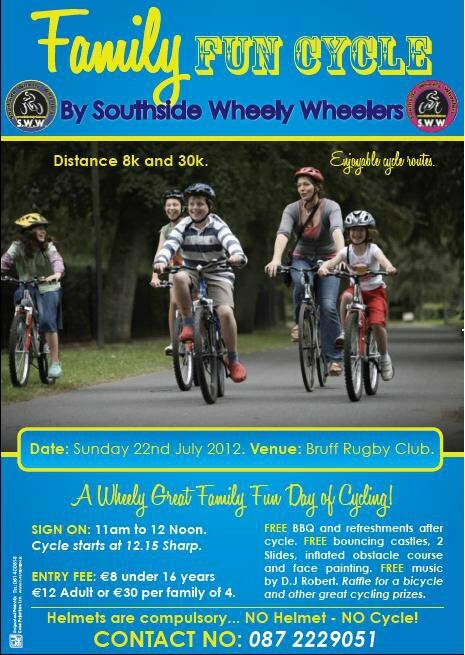 SWW Family Fun Cycle is on Sunday 22nd July. 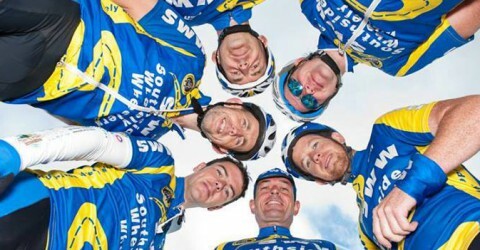 Southside Wheely Wheelers is a cycling club who promotes cycling for all ages and with the support of our families all year as we train and cycle in leisure tours and cycling races all over Ireland. Family is important for our cycling club and our cyclists decided to have a Family Fun Cycle so all the family can enjoy cycling togather. Please email, facebook and tell your family and friends and everone about this great Family Fun Cycle of 8k and 30k on Sunday 22nd July 2012 at the Bruff Rugby Club. We have lead cars, back up vans, motor bike marshals and road marshals for a safe controlled cycle. We have started putting these posters in all towns in Co Limerick and all over Munster. Follwing the cycle we have a BBQ and food and refreshments, slides and face painting and music by DJ Robert. We will have a raffle for a Bicycle, signed Jersey’s by Stephen Roche who won the Tour De France 25 years ago. All we need now is to advertise and let families know about this wheely great family event and hope we get a sunny day to enjoy cycling.